1 2010/03/05 Japanese com.. Volume 57 of "ONE PIE..
2 2010/02/15 Japanese com.. One Piece::It is a little ..
3 2009/08/24 Japanese com.. I added this week's naruto..
4 2009/06/29 Japanese com.. "Ane Dokitt" by ..
5 2009/06/19 Japanese com.. Ultra Jump & CLOTH ROA..
7 2007/12/03 Japanese com.. The start of the study of ..
2010/03/05 "Japanese comics > Volume 57 of "ONE PIECE" made the recod of the most sold book as an initial release in Japan"
Volume 57 of "ONE PIECE"
made the recod of the most sold book as an initial release in Japan. 3 million books were sold as an initial release. The book was released yesterday (on 4th of March). 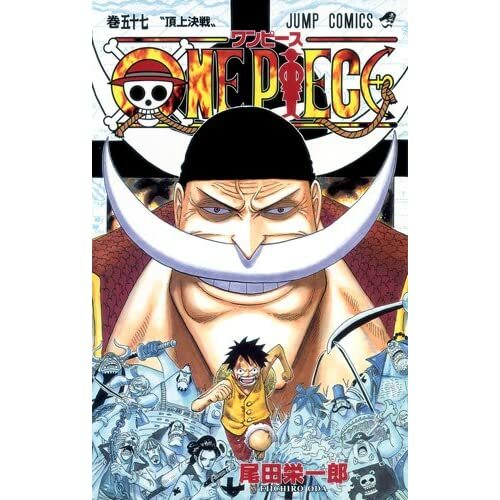 2010/02/15 "Japanese comics > One Piece > It is a little bit surprise for me to see Ace of One Piece died really"
Ace of One Piece died in this week's Boys Jump. Oda said he was avoiding to draw the characters' death as boys comic, so this is a little bit surprise for me. I think One Piece got very interesting these days because I cannot guess what will happen next. 2009/08/24 "Japanese comics > I added this week's naruto and one piece story"
I added this week's naruto and one piece story on Weekly boys jump. 2009/06/29 "Japanese comics > "Ane Dokitt" by Mizuki Kawashita will start from next week on Weekly Boys Jump"
Ane Dokitt by Mizuki Kawashita will start from next week on Weekly Boys Jump. Kawashita Mizuki is the author of "Ichigo 100%" and "First Love Limited (Hatsukoi Limited)". 2009/06/19 No.2 "Japanese comics > Ultra Jump & CLOTH ROAD"
Today is the day when Ultra Jump which is the monthly comics magazine is published. I am very interested in the recent story of CLOTHE ROAD. Garment did quite bad thing which is far more than what I can imagine! And today is the day when the vlume 7 of CLOTH ROAD is published. 2008/06/20 No.2 "Japanese comics > Inuyasha ended"
Inuyasha which lasted more than 10 years on Weekly Boys Sunday ended this week. I couldn't enjoy it these days due to the too long story but the end of the story was nice. I hope Rumiko Takahashi will create new great story some day again. 2007/12/03 "Japanese comics > The start of the study of VMWare"
It seems that VMWare is useful for makein the environment for the development of this site, I will start studying this product. It seems that it enbles us to vitualize the oprating environment, which means that you can use many OS on the single machine. Or you can hide the number of machines behind virtualization and can make many user's environment regardless of who many machines you are using. This is my primitive knowlege, so I may change the document based on the knowledge which I will get from now on. I checked the softwares which are offered by VMWare. You can download this for nothing. It seems that this is valuable because you can download many Operating systems which can run on VMWare player. I installed CentOS 5.0 on which I will make the developing environment first. It seems that you can use Windows and Linux software on Mac. I don't have Mac, so I am not interested in this. This sounds interesting for cutting the cost of offering users' environmnet but I am not a person to offer users' environment to users, I am not intereted in this. You have to contact the sale representitive to know the price. It seems that this can be helpful for managing the security issues. It costs from $1000 to $2000. I don't know the difference from VMWare Player. So I will try this later using trial version. It costs from $1,675 to $3,052. Provision, monitor and manage your virtualized IT environment through a single interface. Streamline development and test lab infrastructure and operations with VMware Lab Manager. You have to contact to sales representitive. Convert Physical Machines to Virtual Machines in Minutes. You can benchmark the software performance on the virtualized environment.